This article discusses Weblogic(J2EE application server) plugin for Maven, a robust build and dependency manager. Maven is a build automation tool used primarily for Java projects. Maven describes how software is built and the dependencies needed for building it. Maven uses convention over configuration and only non default behaviours need to be explicitly defined. XML is used as the configuration language of choice. It comes with pre-defined targets for performing certain well-defined tasks such as compilation of code and its packaging. Maven dynamically downloads Java libraries and Maven plug-ins from one or more repositories such as the Maven 2 Central Repository, and stores them in a local cache. This local cache of downloaded artifacts can also be updated with artifacts created by local projects. 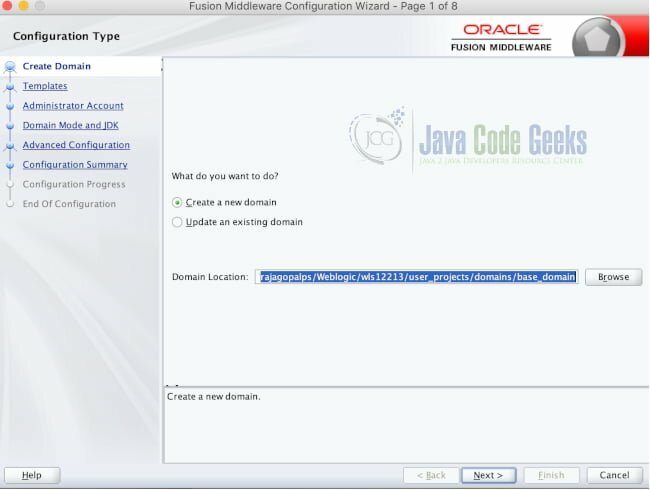 This section will cover the detailed steps of installing WebLogic and also Maven. The final subsection will walk through creating a simple spring project and its deploy to WebLogic. The prerequisite for installation is that the system must already have JDK installed. This opens up a configuration wizard similar to the screenshot below. Next is the configuration of administrator account. 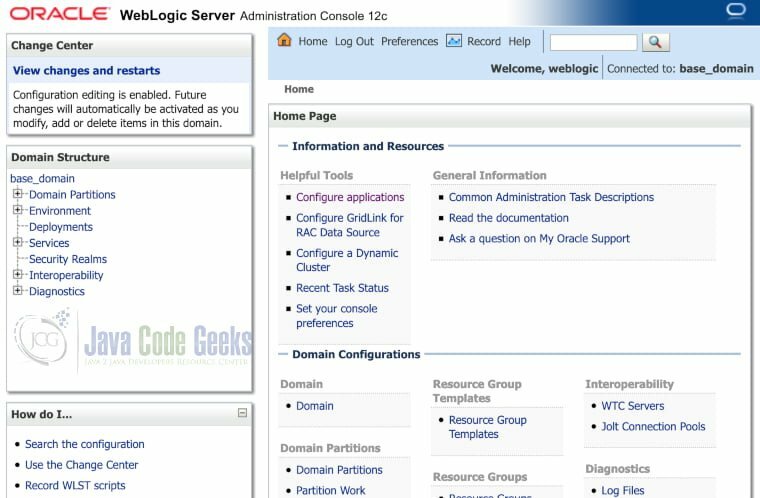 Provide a username and password for the WebLogic Domain. The next screen is Domain Mode and JDK which has values populated by default as development and the JDK installation path. Click Next till the summary page for the defaults and click on Create to create the WebLogic domain. Once the domain is created, navigate to the domain directory created similar to wls12213/user_projects/domains/base_domain in the command line. Execute the startWeblogic.sh from the command line. 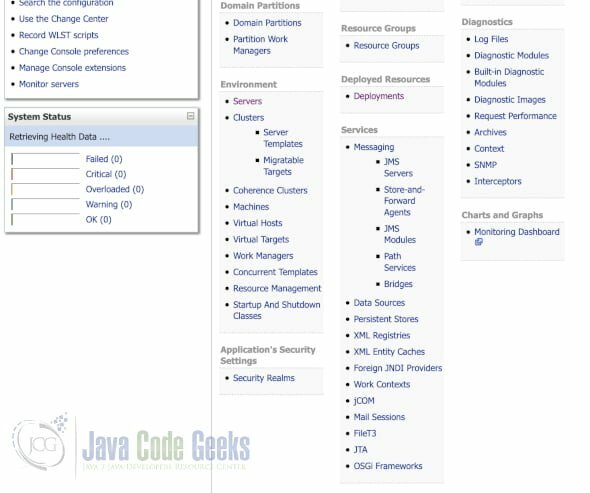 This starts the WebLogic daemon and once the startup complete is identified from the console logs, navigate to the link in the browser. Use the already provided username and password in the console. This should take us to the WebLogic administration page as shown below. This involves installing the maven in our platform for dependency management and building the application. Maven can be downloaded from the URL. This provides maven binaries for the appropriate platforms. Alternatively in Linux and Mac environments maven can be installed by the default installers(eg: brew for mac and apt for Ubuntu). Maven installation can be verified by executing the command mvn -version. Almost all Java IDEs support creating a maven project. We will create a simple maven project in the next subsection. The below section shows a configuration for Spring boot Maven project will all dependencies required for running the project. Since the project needs to be installed to WebLogic Server, the packaging is provided as WAR file. Spring Boot Starter for Web is provided to create a web application and Tomcat is added for local testing. Spring Boot Maven plugin is provided to add the capability for Maven to build a Spring Boot project. To support WAR packaging, the Maven WAR plugin is added and is configured not to throw an error when WEB.xml is not found. A get Method is configured for the root endpoint which returns the string hello! This is the main starting point of execution for SpringBoot Application which is indicated by annotating with SpringBootApplication. The class extends SpringBootServletInitializer andWebApplicationInitializer to indicate it is a web application. The class also initializes DispatcherServlet which will be used to serve requests. The context path is also provided as /demo so that in embedded mode application runs under the specified root. Only spring beans declaration has been provided to indicate that spring dispatcher Servlet will be used to handle incoming requests for the application. We specify the context root as /demo for our WebLogic application. We specified the list of application packages such as spring and slf4j also to be retained under WebLogic application. This ensures that Spring Servlet serves the request and SLF4J logging package is also included for logging purpose. The application can be executed by running the file SpringBootWebLogicApplication.java. On Execution, we can open the browser with the URL. This opens a webpage with the text Hello!. The application can be built as a war file by executing the command mvn install. This generates a WAR artifact in the target directory. This WAR file can be manually deployed to the WebLogic Server configured as part of section 2.1. This can be done by moving to the deployment section in the WebLogic Server administration console and uploading the WAR file. We already covered two plugins in the previous section( Maven WAR and SpringBoot plugin). Plugins are way to extend additional capability to the Maven using the interface specified by Maven. We will use the maven plugin architecture to add the weblogic dependencies to our local maven repository in the next subsection. The previous subsection is a dependency for this subsection to work. Once all the WebLogic dependencies are copied to our local repository, We can use the WebLogic Maven Plugin to deploy the artifact to WebLogic Directly. We specify the local URL of WebLogic along with the username and password needed for the administration console. We provide the location to the WAR file available in our target directory. We provide the application name as build name. We indicate deploy as a subgoal of install phase ensuring that the deploy task is called when mvn install is executed. Now running mvn install not only generates the artifact but also automatically deploys to the WebLogic Server. The WebLogic Server must be up and running for this command to work.